If you have any questions about the NEW BERMIE information page below please contact us. This 58 metre (190 foot) luxury yacht was built at Cmn Yachts (Cmn Group) in 2007. Motor Yacht NEW BERMIE is a sizeable superyacht. She could be considered a recent full displacement yacht. The firm of naval architecture who actualised this yacht's design work on this ship was Cmn and Andrew Winch. The interior design work was the brain child of Andrew Winch. 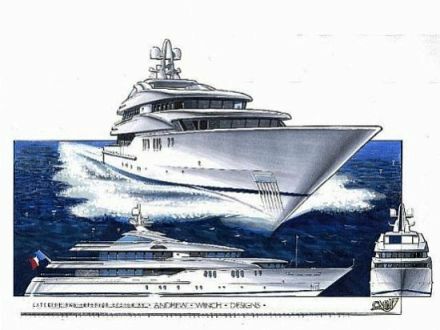 Cmn was the naval architecture company involved in the formal superyacht design work for NEW BERMIE. Also the company Cmn and Andrew Winch expertly collaborated on this project. Interior designer Andrew Winch was employed for the creative interior ambience. France is the country that Cmn Yachts (Cmn Group) completed their new build motor yacht in. After her formal launch in 2007 in Cherbourg she was afterwards delivered on to the owner after sea trials and testing. A fairly large area is achieved with a widest beam (width) of 11.2 metres or 36.75 feet. With a 3.05m (10ft) draught (maximum depth) she is deep. The material steel was used in the building of the hull of the motor yacht. Her superstructure above deck is created with the use of aluminium. The 3516B engine installed in the motor yacht is made by CATERPILLAR. For propulsion NEW BERMIE has twin screw propellers. The main engine of the yacht gives 2199 horse power (or 1641 kilowatts). She is fitted with 2 engines. The sum output for the boat is accordingly 4398 HP or 3282 KW. Providing bedding for a limit of 12 yacht guests spending the night, the NEW BERMIE accommodates them in luxury. 58 metres / 190.3 feet. The main engines are two 2199 HP / 1641 kW Caterpillar. The Model type is 3516B diesel. Giving the combined power of 4398 HP /3282 KW. 2 times 164 Kw, 1 times 135 Kw. 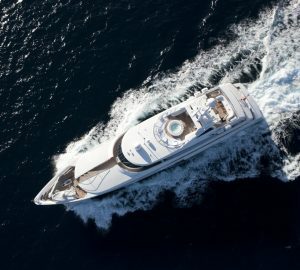 The luxury yacht NEW BERMIE displayed on this page is merely informational and she is not necessarily available for yacht charter or for sale, nor is she represented or marketed in anyway by CharterWorld. This web page and the superyacht information contained herein is not contractual. All yacht specifications and informations are displayed in good faith but CharterWorld does not warrant or assume any legal liability or responsibility for the current accuracy, completeness, validity, or usefulness of any superyacht information and/or images displayed. All boat information is subject to change without prior notice and may not be current.